Create an organic nest with our Bedding Essentials Plus Set. 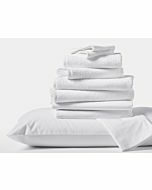 Combining our finest organic bedding basics—Three Season Down Duvet Insert, 2 Down Pillows, 2 Pillow Protectors, plus a GOTS-certified Mattress Pad—a healthy sleep environment is just one click away. 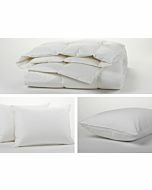 The down insert provides warmth without weight, and the down pillows provide perfect support for stomach or side sleepers. 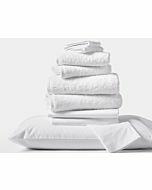 The pillow protectors and mattress pad will extend their life by offering protection from everyday wear. All products are made with 100% organic cotton and responsibly sourced down. Please note we are unable to accommodate any substitutions for our Coyuchi Exclusive Sets. All items in all Sets must be returned together in order to be accepted for processing.